With Spirit Voyage we are doing a 40 Day Sadhana called Elevating Ourselves, Blessing Our Children. To find out about it and even sign up you can visit the following link: http://www.spiritvoyage.com/Globalsadhana/ElevatingOurselvesBlessingOurChildren. As a part of the practice we are chanting the following Shabad (Sacred Song) from the fifth Guru of the Sikhs, Guru Arjan, called Pootaa Maataa Kee Asees. We are reciting it 11 times a day for our children and the children of the world, with and without homes. Jis simrat sabh kilvikh naaseh pitree ho-ay udhaaro. Remembering God, all mistakes are washed away and one’s ancestors are redeemed and saved. Always chant God’s Name, Har, Har. God is inside you, God is infinite. Nimakh na bisara-o tum ka-o har har sadaa bhajahu jagdees. ||1|| rahaa-o. Satgur tum ka-o ho-ay da-i-aalaa santsang tayree preet. May the True Guru be kind to you, may you love to be with the Saints. Amrit peevhu sadaa chir jeevhu har simrat anad anantaa. Drink the nectar of God’s Name and live long, may meditation on God bring you endless bliss. May love be yours and your hopes fulfilled. May you never be worn by worry. Bhavar tumaaraa ih man hova-o har charnaa hohu ka-ulaa. Let this mind of yours be the bumble bee, and let the Lotus Feet of God be the flower. O Servant Nanak, link your mind in this way. Like the sparrow hawk finding a raindrop blossom forth. The gift of chanting this Shabad is that the presence of the Shabad Guru, the living presence of the Guru, comes to life, and essentially comes to your aid. It is a very real energy. Things that you could never imagined to be healed get healed. And when you chant the Shabad Guru for your children the effects are subtle, amazing, and beyond anything you could ever dream of asking for. There is just this kind of energy shift that takes place within your own being, and in your environment when you call upon the energy of this Shabad. Children feel it. They feel this kind of energy above anything else. It is the energy of soul and spirit. When you nurture the energy of soul and spirit, when you support it, when you pray for it, our children prosper. Now here is the really deep part for me today in reciting this Shabad. As the line above states, “Remembering God, all mistakes are washed away and one’s ancestors are redeemed and saved.” This is an incredible opportunity that we have! In chanting God’s Name, in chanting with purity of heart we not only heal ourselves but our connection to our ancestors. In essence, we are completely connected to our ancestors. Now we have the opportunity to heal them as well. So, not only are we praying for our future, but also healing our past and giving the gift to our children that they may move forward into their lives with a clean slate, and with purity of heart. This is the gentle, beautiful mother energy of the universe at work. God Bless You. Thank you for your prayers for the children. 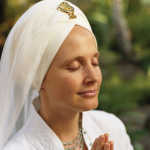 Snatam Kaur on "Poota Maataa Kee Asees"